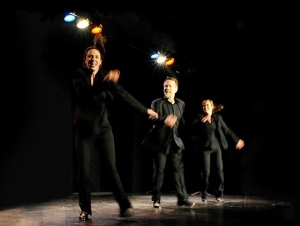 When Lane Alexander and Kelly Michaels founded the Chicago Human Rhythm Project as a one-time summer festival in 1990, the Kennedy Center had already been staging a wide range of cultural programming for nineteen years, but had never presented an evening of tap dancing on one of its main stages. More than twenty years later the uniquely exciting world of tap dancing, in full resurgence, had still never been presented as a full evening program at any of the national cultural center’s principle venues, but that’s about to change. Chicago Human Rhythm Project will present JUBA! Masters of Tap and Percussive Dance at the Kennedy Center’s Eisenhower Theater in a show that will certainly be an important historic event, but is every bit as certain to be an explosively entertaining ride through a brand new world, the world of Tap and Percussive Dance. It’s a world that’s been brand new since around 1650, when the dance traditions of two different cultures, West African and Irish, began to exchange inspiration. Indentured servants arriving in colonial America, mostly Irish and Scottish, brought with them the rapid toe and heel movements of jigs and other social dances. There was an ancient, percussive element to much of their dancing, emphasized by the sounds made by their wooden dancing shoes, and when Africans kidnapped into slavery began to combine these elements with their traditional “Juba” and “Ring Shout” dances, the world first began to see the brand new rhythms of American Tap. It’s a world of originality that never stopped being new because of its fundamentally individual expression. Even the blistering excitement of a Chicago Human Rhythm Project show can never capture all, or even most, of the broad history of the art, but that probably doesn’t matter. Tap is an art that has never really tried to define itself; there’s just too much of it. It was two hundred years before Tap started being something that you saw on a stage, and another fifty or so before it became known as “tap dancing” at the beginning of the twentieth century. For another fifty or sixty years, the art went from lighting up Vaudeville stages to its multi-faceted explosion in uncounted Hollywood musicals, and even though by 1990 it seemed to be getting a little lost in the emerging empires of concert dance and media culture, it was still a huge, if less visible force. That’s about where Lane Alexander and the Chicago Human Rhythm Project came in. Alexander had already toured extensively and successfully as an artist when the Chicago Human Rhythm Project’s first venture met with such success. About two hundred people saw that first concert; now the Company presents classes to thousands of young people each year, and their productions have enchanted hundreds of thousands at concerts and festivals around the world. Their Kennedy Center performance will be a synthesis of much of what is exciting in the broad world of percussive dancing, an illuminating chance to enjoy the vibrant elegance of an art form in its youth. Perhaps the most broadly recognized idea of modern tap is its interaction with that other uniquely American art, Jazz, in a form that often begins with a dancer setting a ‘time step’ for a jazz trio. The performers then move through a series of shared musical explorations, with the tap artists performing both as dancers and percussive musicians. JUBA! Masters of Tap and Percussive Dance will feature the performance of the Greg Spero Trio with some of the best tappers around, but it will also include a carefully chosen representation of several other artistically imaginative realizations of rhythm dancing. Among the many highlights, Jump Rhythm Jazz Project will perform Billy Siegenfeld’s There Never Was A War That Was Not Inward, and Step Afrika will bring the uniquely engaging art called Stepping to the Kennedy Center audience. “People will find something that they recognize, and they’ll find at least a couple of things that completely surprise them,” Alexander says, describing the Kennedy Center performance. “They’ll leave with a completely new and expanded idea of what tap and percussive dance can be.” That’s the whole idea of what Lane Alexander and the Chicago Human Rhythm Project have been doing for twenty-two years, expanding the idea of what the brand new art form can be. It’s a process that is probably just getting started; the whole art is always new because it’s always expanding, expanding geometrically with the individual inspiration of each moment in an essentially personal kind of performance. That may explain why this will be the first time in the forty-one year history of the Kennedy Center that one of the nation’s oldest and most original art forms will be a full-evening main stage event. The world of tap and percussive dancing is just so rich that it takes somebody like the Chicago Human Rhythm Project, with twenty-two years of presenting it, to fit even some of it into a single show. Of course there may have another reason, a structural one; after all, this show just might tear the roof off.